The French government has said it has ordered 89,000 members of the security forces to be deployed nationwide during anti-government protests on Saturday, December 8, in a reaction to violent riots in Paris and elsewhere in the past few weekends. Reuters news agency cited French Prime Minister Edouard Philippe as stating on TF1 television on Thursday, December 6: “We are facing people who are not here to protest, but to smash and we want to have the means to not give them a free rein”. 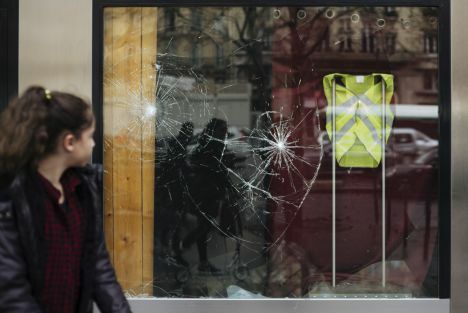 The head of French government added that about 10 armored vehicles belonging to the gendarmerie would also be used, the first time since 2005 when riots broke out in Paris’ suburbs. Meanwhile, Paris plans to close the Eiffel Tower, museums and monuments during the protests. The protests have hit major cities, causing damage and disruption over the past three weekends, five people have died, dozens have been injured and hundreds arrested in riots. The protests have forced the government to postpone fuel tax hikes.